I just got back from a six-week-long trip to western and southern Africa. On previous trips like this I wrote travelogue entries in real-time, but there has been a rash of burglaries in our neighborhood recently and so I decided it would not be wise to advertise the fact that we were out of town. So I'm going to go back and blog about the trip stop-by-stop as if it were happening in real time. The trip consisted of two parts. The first was a cruise on the Oceania Marina from Lisbon to Cape Town, and the second was a safari that took us to Victoria Falls, the Okavango delta, and the Madikwe game reserve in South Africa. Then at the end we spent two days in Johannesburg before returning home (though, as you will see, we didn't get to see much of the town). We flew to Lisbon on Lufthansa by way of Frankfurt. 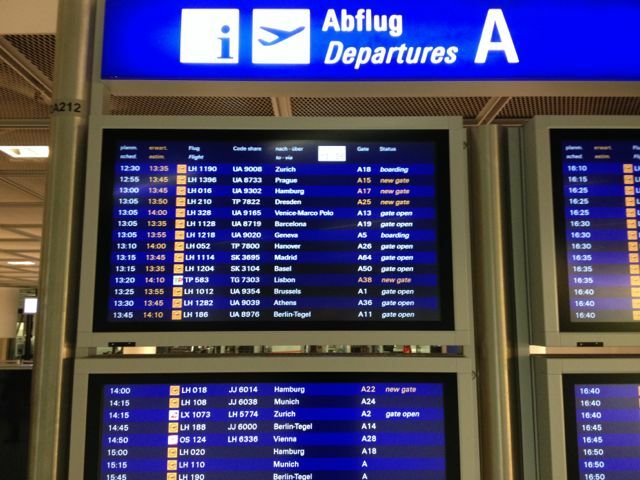 We were originally scheduled to have a two-hour layover in Frankfurt, but two months before we left, Lufthansa suddenly cancelled our connecting flight, which left us with an eight-hour layover. That's an awfully long time to be hanging around a terminal (particularly with ten time zones worth of jet lag), so we decided to get a day room at one of the hotels adjoining the airport. There was our original connection to Lisbon, the one that would have given us a two-hour layover instead of the eight-hour one we were now facing. To say that I was annoyed would be quite the understatement. Since I'm not writing in real time, I can fast-forward a few days and report what our travel agent told us when we reported this to him. As you can see from the departures board, the flight to Lisbon is not a Lufthansa flight, it's a TAP (Air Portugal) flight. It had been cross-listed as a Lufthansa flight. According to our agent, TAP cancelled the flight and then reinstated it without the cross listing. Maybe I should write a letter to Lufthansa's CEO. Notwithstanding the extra delay, we finally made it to Lisbon, spent the night there, and the next day embarked on our journey. As it happens, it turns out there are much worse things that can happen while traveling than having a flight delayed by six hours. On the ship I encountered a couple whose bags had been lost, and were not located until the end of the three-week cruise -- in San Francisco! So maybe I should just count my blessings and forget about getting bumped off the earlier Lisbon flight.